The association and measured value status of dimensions is driven by the settings located in this Dimensions pane. Because you can enable/disable these settings, the integrity of dimension associativity requires discipline on your part. Making dimensions associated with their referenced geometry allows both dimensions and detail entities to move automatically with the modified geometry upon which they are based. Making dimensions measured value causes their values to update with the model. This makes for quicker and more efficient design and revision of files containing dimensioned geometry. NOTE: None of the association and measured value settings contained in the Tools>Options>Dimensions pane are selectable when a file is loaded (including New File). Association is determined by the integrity of a dimension’s connection to an entity. A dimension based off of, or positioned from, geometric positions on an entity is an associated dimension. For instance, a dimension associated with two endpoints of a line is an associated dimension. A dimension whose positions are cursor-selected, or placed using key-in, is un-associated. A dimension whose value is accurate and updates in accordance to changes made to the entity to which it is attached is considered an measured value. NOTE: A dimension does not use the measured value when (1) the program cannot determine the value of the dimension, or (2) when you enter a value or text manually. Associative geometry required; Measured value required - When selected, You are not be able to create non-associative dimensions. You are not able to enter a value or text manually. You are not able to import non-associative dimensions. Existing dimensions are destroyed as soon as they become non-associative. See Associative Geometry and Measured Value Required for more information on how this setting impacts the handling of dimensions. Associative geometry required; Non-measured value allowed - Same as Associative geometry required; Non-measured value allowed above, except you are able to enter a value or text manually. Associative geometry not required; Non-measured value allowed - When selected, you can create non-associative dimensions, you can enter a value or text manually, dimensions that become non-associative are not destroyed. While this setting provides expanded editing capabilities, such editing may result in incorrect dimensions. It is advised that you are fully aware of this if and when you elect to allow non-associative or non-measured value dimensions. The following settings are also contained on the Dimensions pane. Note that none of these options are available unless you select the Non-associative geometry allowed; Non-measured value allowed option. Correct value of dimensions when re-associated - When selected (default), the value of a dimension that is re-associated is updated to comply with its new entity association, even if the text of the dimension had previously been edited. It is advised that you keep this option selected. 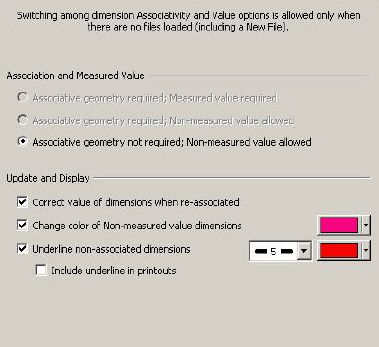 Change color of non-associated dimensions - When selected, any dimension that is non-associated currently or that becomes non-associated, appears in the color you specify on this pane. This allows for better distinction between associated and non-associated dimensions. Because the color of the dimension is not affected, masking still uses the dimension's original color. You can re-associate dimensions that are flagged as non-associated. (See Re-Associate Dimensions.) When you re-associate a dimension, it returns to its original color. Underline non-associated dimensions - When selected, the text of non-associated dimensions is underlined with the color/line attributes you specify on this pane. ISO 129-1985E Section 4.4.3 requires this marking method for out-of-scale dimensions. When you select this option, orphan dimension underlines appear in printouts of the dimension(s).